In addition to desktop-based Office 2010 Beta, Microsoft has already ready its Office Mobile 2010 Beta for Windows Phone device running on Windows Mobile 6.5 OS, the mobile companion for Office 2010. With Microsoft Office Mobile 2010, users can view and edit the Office documents with high-fidelity or taking notes while on the go. Office Mobile 2010, like its predecessor, includes Word Mobile, PowerPoint Mobile, Excel Mobile and SharePoint Mobile, with addition of Outlook Mobile and OneNote Mobile. 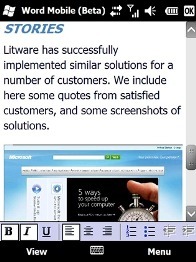 Office Mobile 2010 integrates with Windows Mobile 6.5 to offer an intuitive and simple experience. Stay connected from anywhere with SharePoint Workspace Mobile. View and edit your documents with confidence. Search to easily find what you’re looking for. The Office Mobile applications have many of the same formatting tools you already know and use in Office. Quickly update and instantly recalculate your Excel workbooks. Stay organized and in sync with OneNote. Outlook Mobile makes managing your e-mail a snap. Seamlessly copy and paste across applications. To download the Office Mobile 2010 Beta, users have to be in the United States and have a Windows Mobile 6.5 phone. Office Mobile 2010 Beta is not supported on WM 6.0 or 6.1 device. For WM 6.5 device, simply visit the Windows Marketplace for Mobile by starting the Marketplace app to look for Office Mobile 2010 Beta. Once installed, Office Mobile 2010 will run through April 5th, 2010. 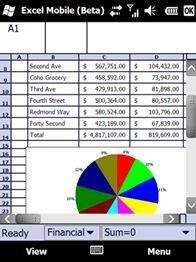 Update: Final RTM version of Office Mobile 2010 has been released.